If you are planning to make a large balance transfer from one credit card to another it's worthwhile looking at ways to avoid it. Fees typically add between 2% and 4% to your bill. A question that is frequently asked of the MoneyMaxim team is whether there is a balance transfer credit card where there is no transfer fee payable. The normal rate for these fees is between 1% and 3%, so if you have a debt of say £1,000 it's worthwhile trying to avoid it - double the debt and it's even more worthwhile. Whilst, occasionally, there are promotional periods offering lower fees it's very rare that a credit card company undertakes a 'fee free' promotion - and even rarer that that will coincide with the time you want to do a transfer! However, there is a way to transfer debts to a new interest free card with no fees - providing you have a debt that is less than your normal month's shopping bill - and also to save on the fee if your debt is lower than a couple of months' normal expenditure. Instead of applying for a best buy balance transfer card, find the best 'interest free purchase' card. The supermarkets such as Tescos and Sainsburys have been traditionally strong in this area. Once it's received, instead of using your usual debit or credit card card to pay for your normal shopping in supermarkets, petrol stations, online or on the high street, use your new interest free purchase card. And use the funds you would have used for your shopping to pay off your debt on the card which is accruing interest instead. Don't, however, use this method if your debts are more than a month or two's expenditure - otherwise the balance transfer fee you will be saving will be lower than the extra interest you will be paying your existing card provider. And, whatever you do, please don't spend on the new card and decide not to repay the old one - that will end up in disaster! The good news about using this method is that these cards do not require as strong a credit rating as some of the balance transfer cards - so they are open to more. If you are, however, unsure how good your rating is at present, you can always run a credit check using a service such as Credit Expert - which is subject to a monthly fee but allows a 30 day trial period during which a credit check can be run free of charge. If you would like to talk to one of our team about using this method feel free to call us on 0800 520 0699 - our team of money saving experts would be happy to explain further! This information is based on journalistic investigation and research. It is not financial or legal advice. Any information should be considered in regard to specific circumstances. A Balance Transfer Credit Card can be an excellent way of clearing credit card debts more quickly. Rather than paying the 'standard' rate of interest - normally around 18% or so - you can switch the balance to a new credit card, paying a fee of around 3% - and then get a lengthy interest free period during which you can make repayments without seeing them eaten up by the monthly interest payment. Many borrowers have used this process over a number of cards to manage their debts down. You normally need to find a credit card company with whom you do not currently have a relationship to be successful in your application - but there is a lot of choice in the market at the moment with competition really hotting up. MBNA and Virgin Money currently offer some of the longest terms interest free for balance transfers. Barclaycard still have a very competitive offering for those with a lower credit score although their charges tend to be higher than some. Santander offer fee free balance transfers. HSBC also have attractive propositions. Do remember that you cannot transfer balances from a card which is part of the same company any new card is with, but at least there is plenty of choice at present. 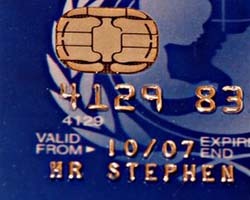 As the fees involved in taking a balance transfer differ from card to card, the cheapest card will depend on the length of time you wish to borrow for - we suggest you consider the maximum period you wish to take an interest free balance transfer for, and then find the one offering the lower balance transfer fee available that period. If you are looking for an alternative type of card (such as a long interest free purchase, cashback or reward card) please refer to our credit card index. If you want to discuss the ins and outs of balance transfer credit cards do not hesitate to call the MoneyMaxim customer assistance team.